Breaking: 95,000 non-citizens are registered to vote in Texas, and more than half have voted in one or more elections since 1996, according to officials. 95,000 non-citizens are registered to vote in Texas, state officials discover Of the 95,000 non-citizens registered, 58,000 have voted in one or more elections since 1996. About 95,000 non-citizens are registered to vote in Texas, and more than half of those have cast ballots in at least one election, Texas Secretary of State David Whitley announced on Friday. Whitley's office, along with the Texas Department of Public Safety, had been investigating possible voter fraud for the last year, according to a news release. Of the 95,000 non-citizens registered, 58,000 have voted in one or more elections since 1996. The Secretary of State's office found those numbers by collecting current DPS data of people who have applied for a driver's license or state identification card in the last five years with a green card of visa. The investigators then cross-referenced that data with people who are registered to vote. The Secretary of State's office sent the information to the state attorney general's office, which will decide whether to pursue voter fraud charges. The attorney general's office has prosecuted 130 cases of voter fraud since 2005. 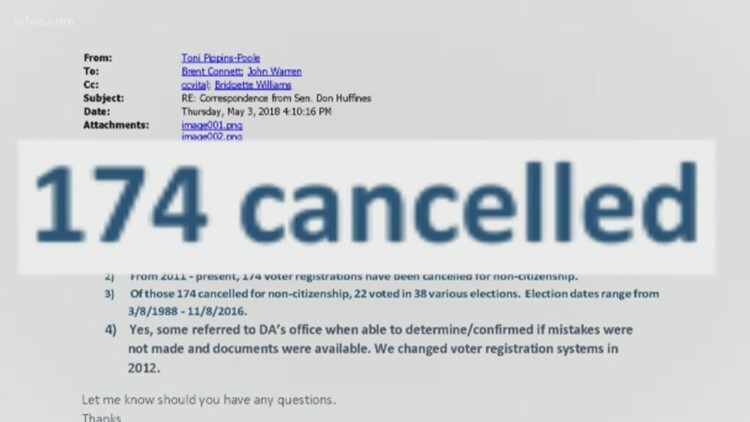 In August, WFAA reported that hundreds of non-citizens had been discovered as registered voters and that the secretary of state's office was working to improve its voter database to determine the exact number of non-citizens registered. This is how red states turn toward blue. Clean up the mess, identify the criminals, prosecute, deport. Legal or illegal, they should not be here participating in illegal activity. Democrats turn a blind eye so while republicans get a say and can do something, they best get at it. Drivers licenses will lead to more fraud in voting. Last edited by GeorgiaPeach; 01-26-2019 at 12:34 AM. An illegal immigrant living in Texas who used a stolen ID to vote at his local polling place received a prison sentence Thursday, according to reports. The suspect, identified as Enrique Salazar Ortiz, of Elmendorf, near San Antonio, will serve nearly three years. Salazar Ortiz, a native of Mexico, was convicted of making a false statement on a passport application, unlawful voting by an undocumented immigrant and aggravated identity theft, the San Antonio Express-News reported. The defendant used the name Jesse H. Vargas Jr. when voting in the 2016 election, a report said, although it was unclear how many other times he may have voted illegally. Authorities said a man with Vargas’ name and birth date had left the area as a teenager, when the now-57-year-old man's family moved to California. But despite that, someone has used Vargas’ ID to vote in local elections “since at least 1994,” Bexar County elections administrator Jacque Callanen told the Express-News. A public defender told U.S. District Judge Fred Biery that three other men had used the Vargas identity over the years. She said Salazar Ortiz began using the name several years back after buying a birth certificate from a man in a bar for $20. His fake ID was detected by the State Department in December 2016 when he mailed in a passport application, the newspaper reported, adding that he was arrested during a raid at his home in August 2017. Click here for more from the San Antonio Express-News. "Of the 95,000 non-citizens registered, 58,000 have voted in one or more elections since 1996...The Texas Attorney General's Office is expected to decide whether or not to pursue voter fraud charges." AUSTIN, Texas (CBSDFW.COM/AP) – Texas Secretary of State David Whitley announced on Friday the results of a year-long investigation into voter fraud. Whitley said his office has identified 95,000 non-citizens who are currently registered to vote in of Texas — 58,000 of whom have voted in one or more election. Texas Secretary of State spokesman Sam Taylor says they “are very confident” the citizenship data used is current. Texas in recent years has aggressively prosecuted voter fraud cases and has one of the nation’s toughest voter ID laws. According to the Texas Attorney General’s office, Texas law allows lawfully present noncitizens to obtain driver’s licenses by showing proof of lawful presence to DPS. However, only citizens are eligible to vote. And Texas law currently does not require verification of a voter’s statement that they are a citizen. The Texas Secretary of State provided the information to the Office of the Attorney General this week, which has concurrent jurisdiction to prosecute election crimes. Judy, Beezer and GeorgiaPeach like this. I wonder how many of these illegal voters voted in California? I have a feeling that it is not just Texas or California elections that has been infested with illegal voters....Examine all states, especially those that have high populations of illegals, and the story could be the same. They have been told by the liberal Socialist Democrats that they are the "future" of this country and must feel empowered to take it over at the ballot box. Criminals all around in my opinion. Last edited by Newmexican; 01-29-2019 at 12:08 PM. It's so disgusting, it really is, just awful. TX, CA, AZ, OR, NY, FL, NM, MS, LA, ID, WA, all states have illegals voting!!! Clean up the rolls. Mandatory Uniform Voting Procedures in State and Federal elections. Pass National Voter ID Law now with tracking system that we can track our votes has been cast correctly! UPS can track packages sent all over the world...we should be able to track our votes and cross reference these votes to the voter rolls!